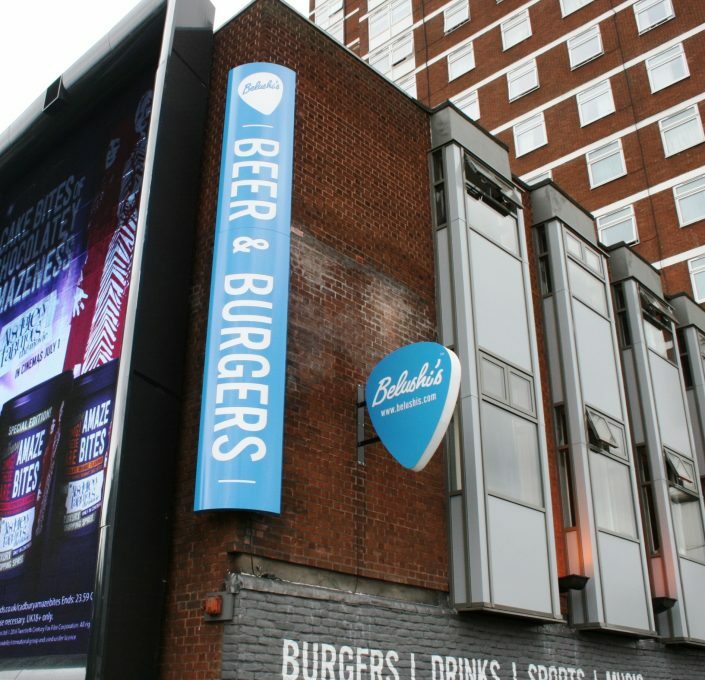 St Christopher’s is the closest hostel to the O2 Shepherd’s Bush Empire and Europe’s biggest shopping mall; Westfield Shopping Centre. The thriving backpacker bar Belushi’s is downstairs which, with a chilled out vibe, is popular with travellers and the local crowd. 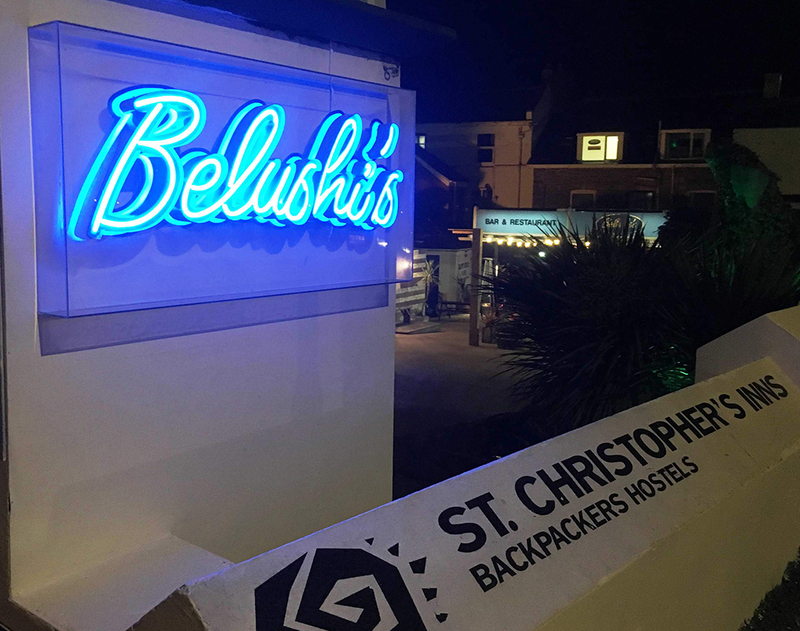 Brief: The brief for St Christopher’s Inns and Belushi’s Bar allowed us to use a range of advanced techniques to create its notoriously vibrant bar signage. 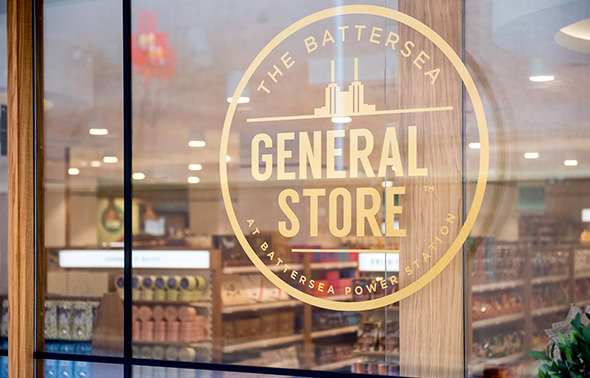 Our client required a variety of exterior illuminated signage and interior signage and illuminated artwork to help create the youthful and lively vibe that the brand is known for across the UK and Europe. 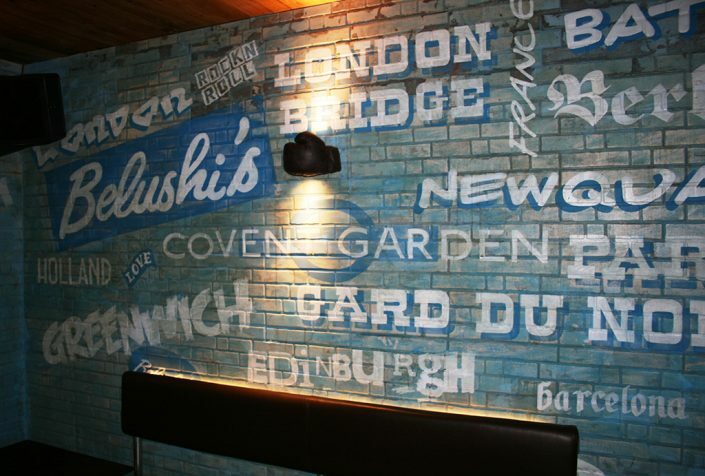 Technical: The work required for the hostel and bar’s bright and energetic signage included the following. 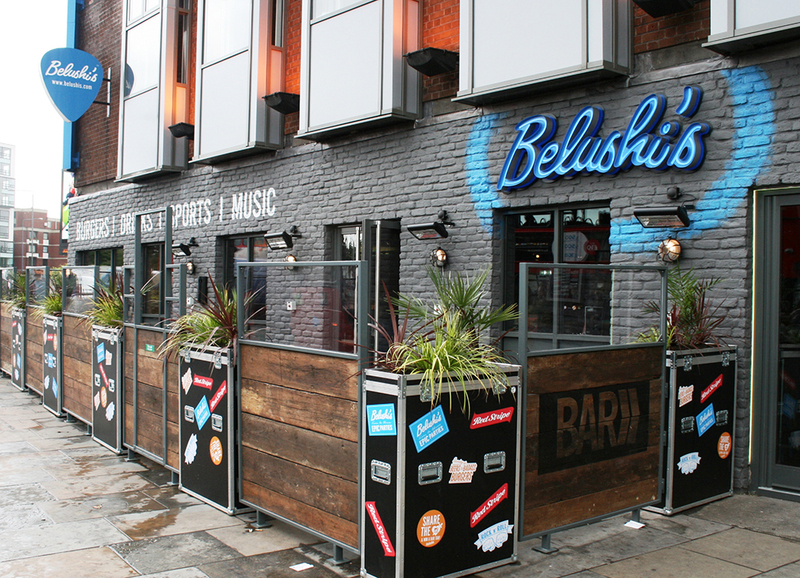 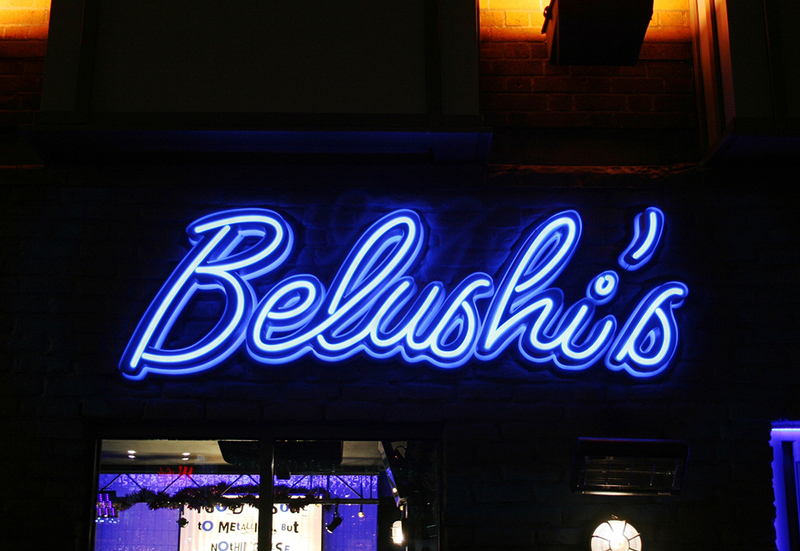 The exterior bar signage for Belushi’s was created with open troughed letters with a 15mm push through opal acrylic. 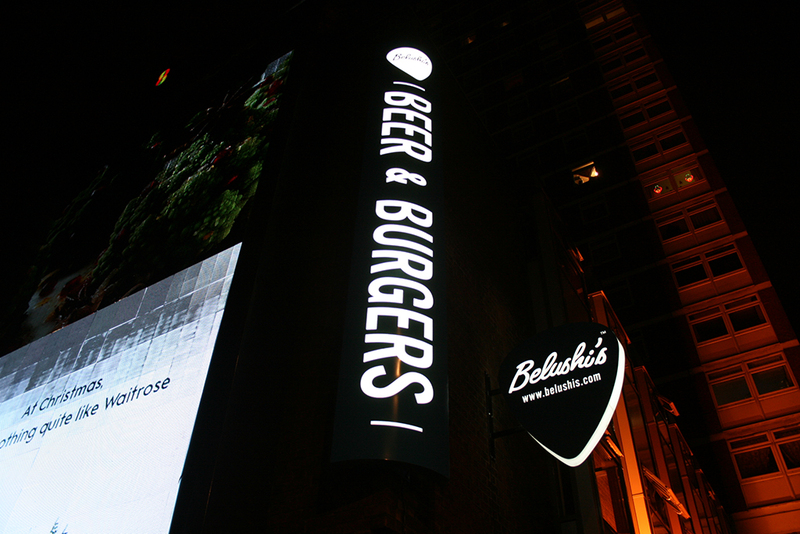 We internally illuminated the sign with blue LEDs providing a halo and faux neon effect. 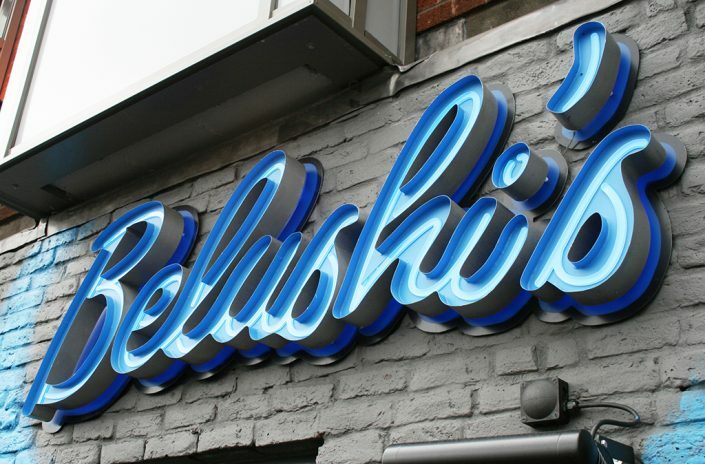 We used the pioneering Neon without the Neon© technique. 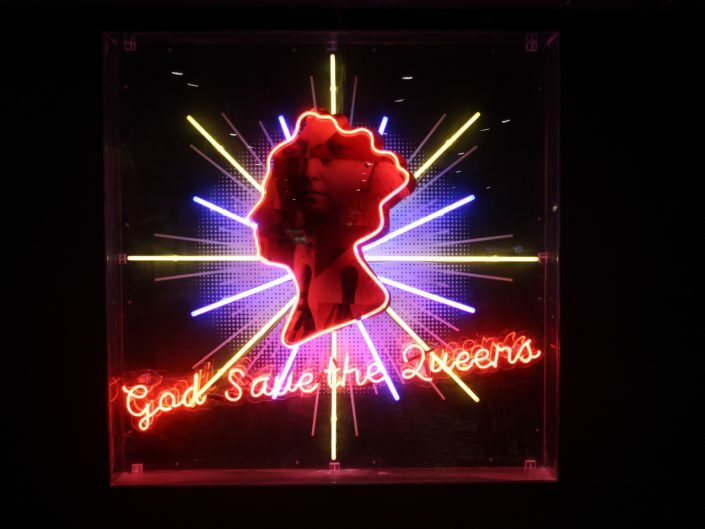 Find out more about Neon without the Neon©. 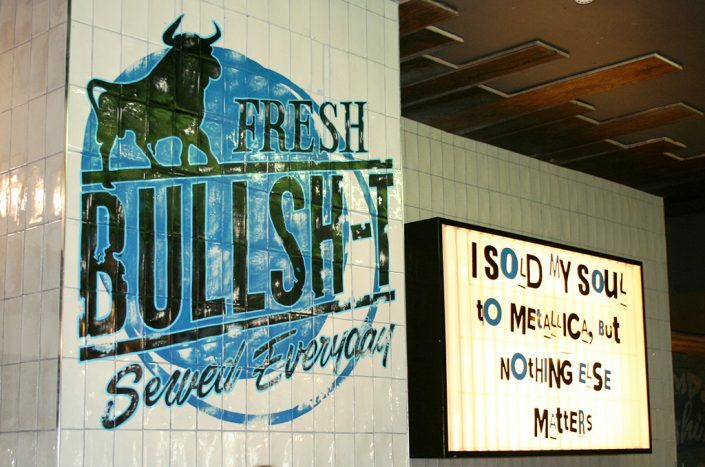 The ‘Fresh Bullsh-t’ sign was created by our friends at ‘Traditional Signs of London’ who are world-class at creating this type of traditionally hand painted sign. 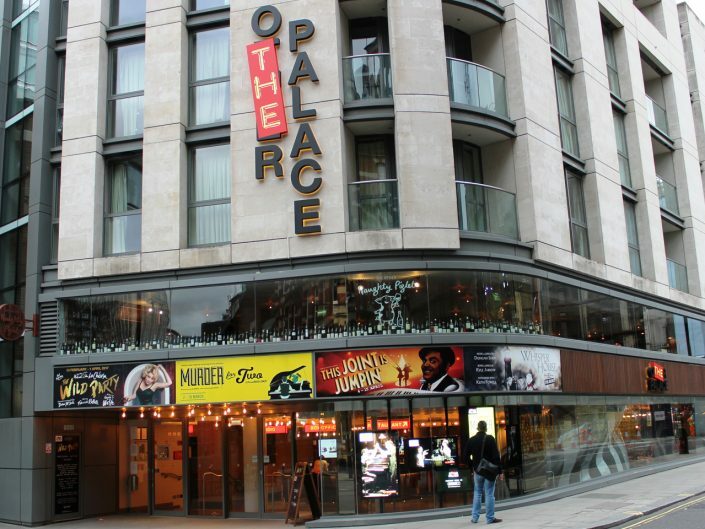 The cinema style light box was manufactured from folded aluminium with a corrugated acrylic face panel. 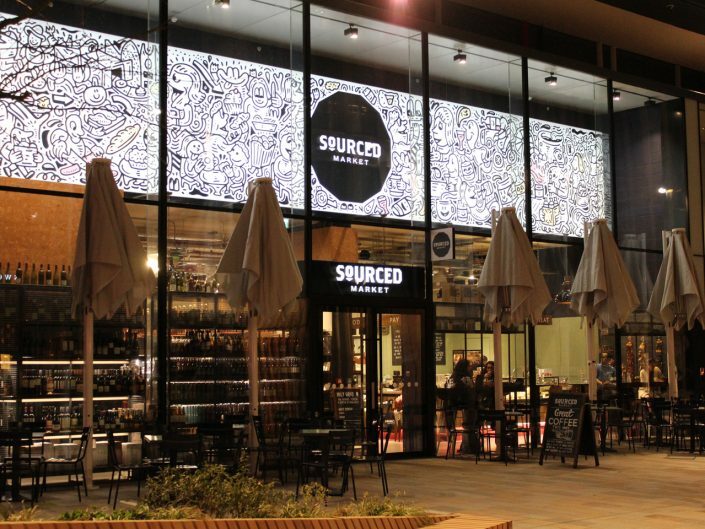 The individually cut acrylic letters faced in vinyl can be interchanged in order to create the quote of the day! 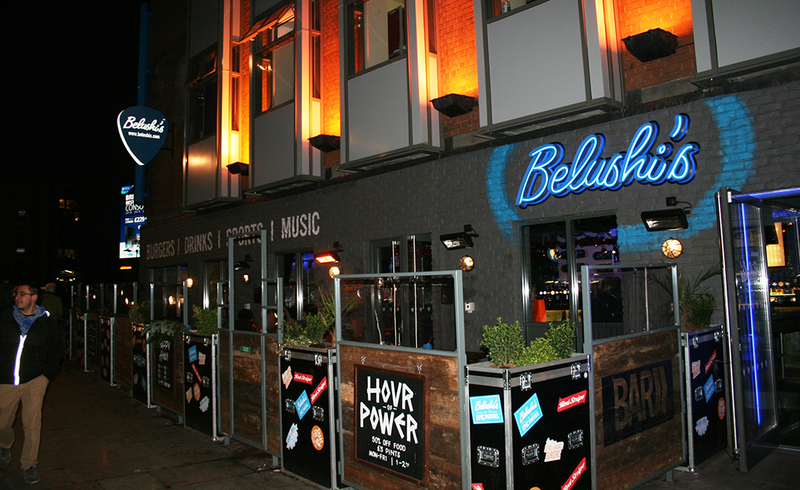 The box is internally illuminated with fluorescent lamps. 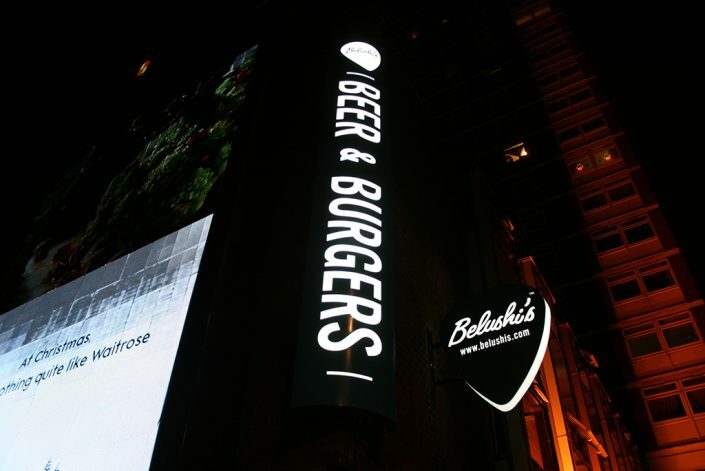 The external ‘Beer and Burgers’ bow-faced Hong Kong style aluminium sign was fabricated with cool white LEDs housed internally to provide text-only illumination, giving a dramatic visual impact at night. 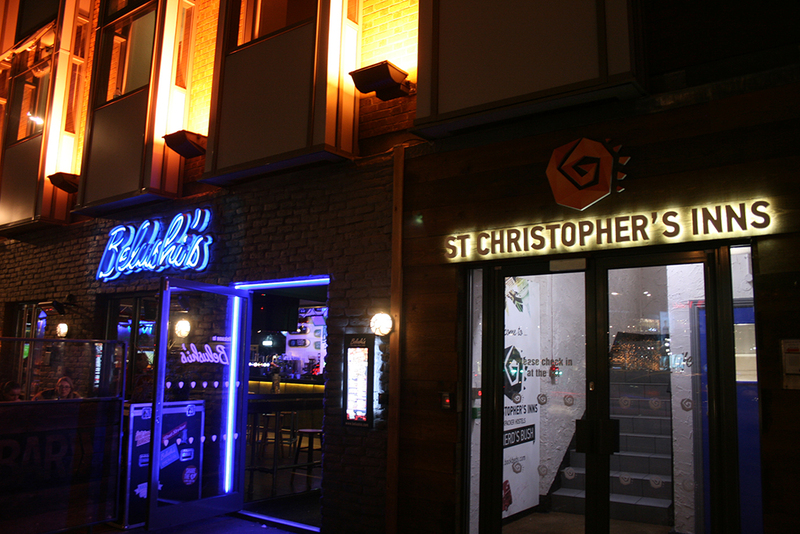 St. Christopher’s Inns external signage was created with built-up letters and warm white LED illumination. 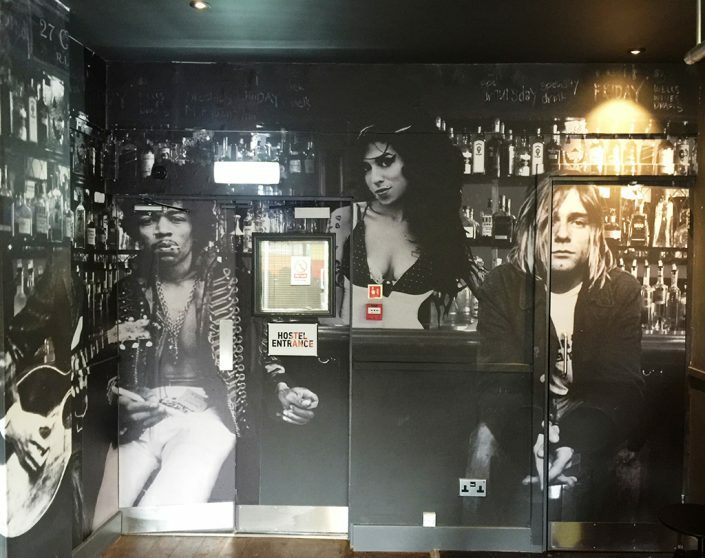 Jimmy Hendrix, Amy Winehouse and Kurt Cobain vinyl prints were digitally printed and hung like wallpaper. 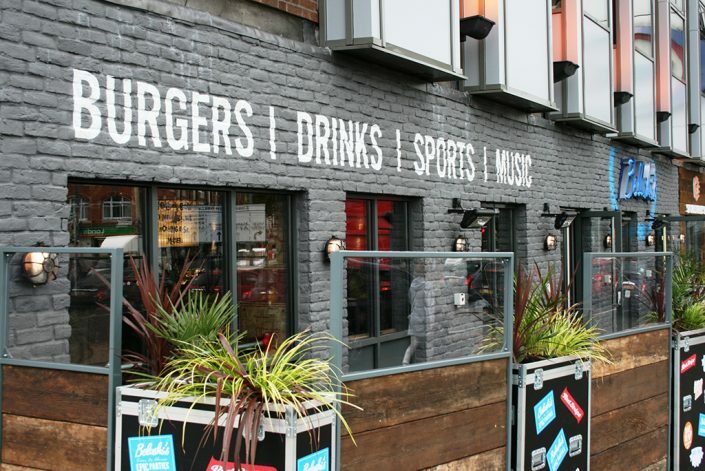 The exterior bar signage included a built-up acrylic plectrum projecting sign which was faced in vinyl with text weeded out to allow the cool white LEDs to illuminate on both sides and the edge.